We used to have a New Years's Eve party every year and some dear friends hosted another party the next day, to watch football and hash over New Year's Eve. I always served Turkey Tetrazzini just after midnight and the next day, Lynn always served Beef Stroganoff (the sour cream kind). She and husband Tony also served milk punch and Bloody Marys in two large white crocks with soup ladles. LOL. It was a tradition back then for our crowd and so much fun. I have such fond memories of those years. 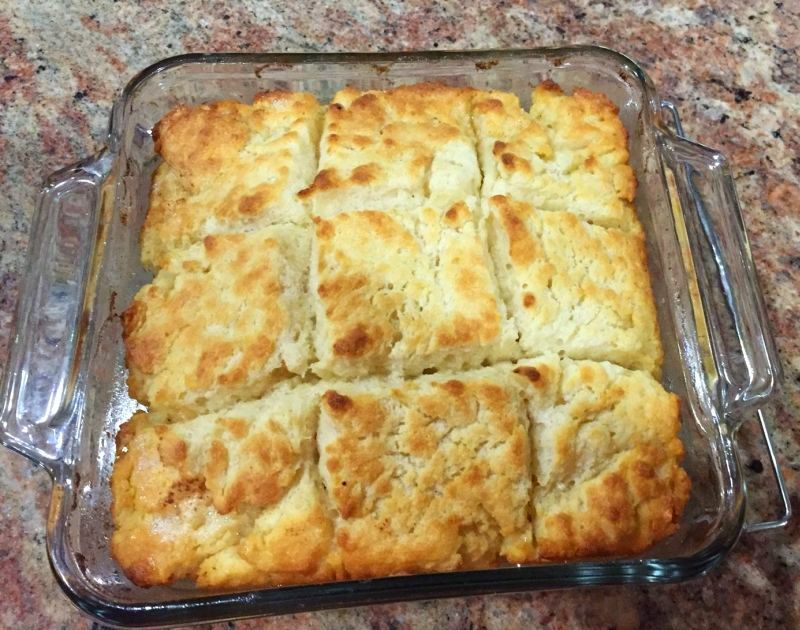 Lynn has long since passed away and I don't think I've made this dish since I moved to Florida so thought I'd make it as my last blog post for 2016. 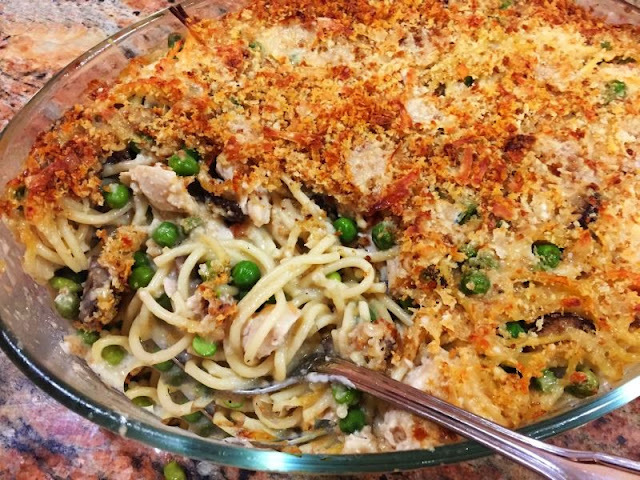 Unfortunately, I couldn't find my old recipe, so went online and found this one, which is nearly the same as mine...tetrazzini is a classic dish and hasn't changed that much over the years. But if I recall correctly, I put fresh nutmeg in mine plus my sauce was much thicker than this one turned out to be, so I'd use more than 1/4 cup flour if I made this recipe again. I made the corrections in the recipe below. Still, it brought back some fun memories. And I still have Lynn's Beef Stroganoff recipe! In a large heavy saucepan cook the mushrooms in 1/4 cup of the butter over moderate heat, stirring, until most of the liquid they give off has evaporated, stir in the flour, and cook the mixture over low heat, stirring, for 3 minutes. Add in a stream the milk, the broth, and the wine, stirring, bring the mixture to a boil, stirring, and simmer the sauce for 5 minutes. In a kettle of boiling salted water cook the spaghetti until it is al dente and drain it well. In a large bowl combine well the spaghetti, the mushroom sauce, the turkey, the peas, and salt and pepper to taste, stir in 1/3 cup of the Parmesan, and transfer the mixture to a buttered shallow 3-quart casserole. In a small bowl combine well the remaining 1/3 cup Parmesan, the bread crumbs, and salt and pepper to taste, sprinkle the mixture evenly over the Tetrazzini, and dot the top with the remaining 1 tablespoon butter, cut into bits. The Tetrazzini may be prepared up to this point 1 month in advance and kept frozen, covered. Bake the Tetrazzini in the middle of a preheated 375°F. oven for 30 to 40 minutes, or until it is bubbling and the top is golden. Here's my second Donna Hay recipe and it's a perfect potato dish for the holidays, although my photograph below doesn't look very Christmasy. I gave this a test run ahead of the holidays and loved the dish so much, I intend to make it for Christmas Eve dinner. Use your mandolin to slice the potatoes...if you don't have one, slice thinly. I used fontina as it's such a nice melting cheese. Wonder how gruyere would taste? Melt the butter in a non-stick frying pan over medium heat. Add the leek and garlic, salt and pepper and cook for 5 minutes or until softened. Place the sweet potato, potato, oil and salt and pepper in a bowl and toss to combine. 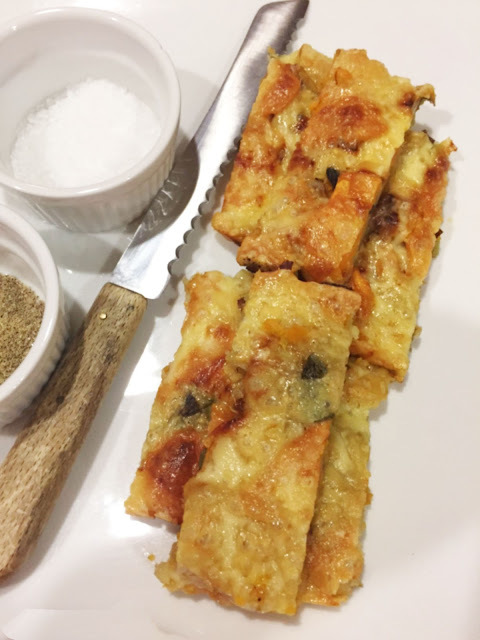 Layer the sweet potato, potato, leek, sage and cheese in a 10 by 13-inch baking pan lined with non-stick baking paper, finishing with a layer of cheese. Cover loosely with aluminum foil and bake for 30 minutes. Remove foil and bake for a further 30 minutes or until golden and cooked through. Serves 6-8. Christmas Breakfast! Oh yes, you must........because I can't begin to describe how divine this tastes! What else can you expect from Zoe Nathan? Something magical happens when you use brioche bread to make French toast. Have you noticed? Nice thick slices soaked in eggs and cream. So extravagant and so perfect for breakfast on Christmas. 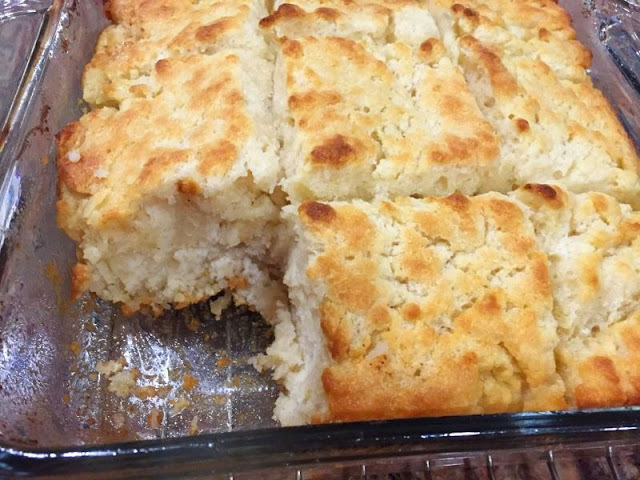 You can make the syrup the day ahead (this syrup is wonderful with anything, be sure to try it) and the bread can also be made in advance and frozen. Use your own recipe for the brioche loaf....mine will be in an upcoming post. Or hopefully, you have a French bakery nearby that has a lovely loaf of brioche! Preheat the oven to 225°. In a large baking dish, whisk the eggs with the heavy cream, light brown sugar, vanilla extract and salt. Heat a large cast-iron griddle and lightly butter it. Working in batches, dip half of the brioche slices in the egg mixture, turning them, until they are well-moistened. Transfer the soaked brioche to the griddle and cook over moderate heat, turning once, until the French toast is golden and cooked through, about 4 minutes. 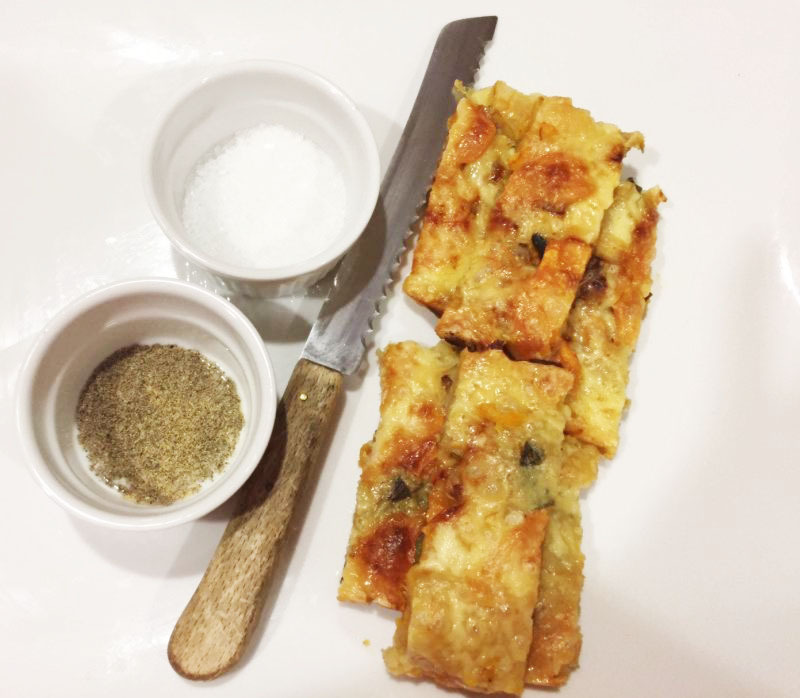 Transfer the French toast to a baking sheet, cover loosely with aluminum foil and keep warm in the oven. Repeat with the remaining brioche slices. 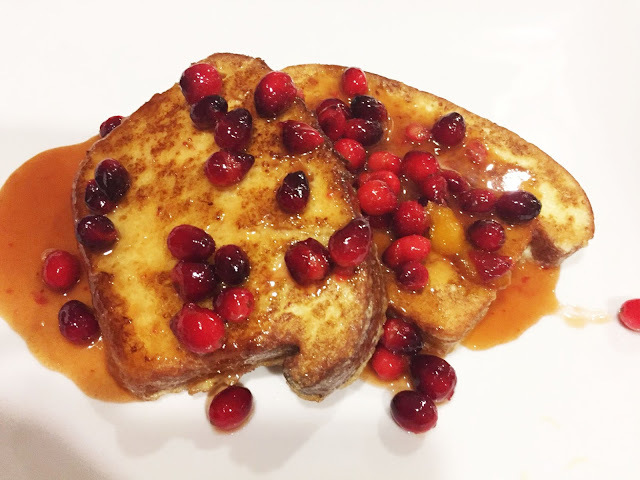 Serve the French toast with the cranberry sauce. The recipe suggests topping with whipped cream, but it's just too much. A sprinkling of confectioners sugar is all and I didn't even use that. Donna Hay magazine is such a treat to read and recently I went through some back Christmas issues and marked a couple recipes to make for the holidays. The first is this awesome sticky date cake. The cake part is moist and somewhat sticky (not as much as a sticky date pudding though) and the orange zest shines through...just the right amount. 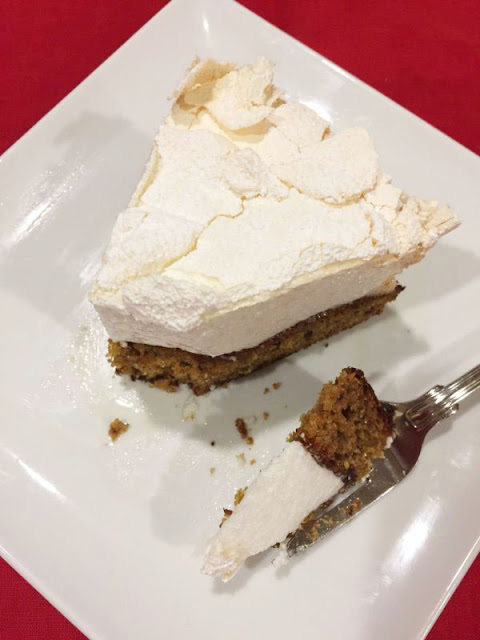 It's a delicious cake all on its own, but Donna Hay has taken it over the top by adding a fluffy meringue. I've made one other cake with a baked meringue and it's always been a favorite of mine, but this one seems perfectly suited for Christmas dessert. Yum. Notes: Be sure to follow the meringue directions exactly. And remember to dip your knife in hot water before slicing into the cake so you'll have a nice smooth edge on the meringue. Preheat oven to 325 F. Lightly grease a 9 inch round springform pan, line the base with non-stick baking paper and set aside. Place the dates, soda and water in a bowl and set aside for 10-15 minutes to soak. Using a hand-held blender, process until smooth and set aside. Place the butter, vanilla, sugar and orange rind in the bowl of an electric mixer and beat for 10-12 minutes or until pale and creamy. Scrape down the side of the bowl and add eggs, one at a time, beating well after each addition. Add the flour, date mixture, almond meal, golden syrup and pistachios and beat until well combined. Spoon into the prepared tin and spread evenly. Bake for 30-35 minutes or until cooked when tested with a skewer. Set aside. Increase the oven temperature to 350 F. Place the extra egg whites in the clean bowl of an electric mixer and whisk on high until stiff peaks form. Gradually add the sugar, one tablespoon at a time, whisking for 30 seconds before adding more. Once all the sugar has been added, whisk for a further 6 minutes or until stiff and glossy. Scrape down the side of the bowl, add the vinegar and cornflour and whisk for a further 2 minutes or until glossy and combined. Spread the meringue evenly over the top of the cake and return to the oven for 15-20 minutes or until the meringue is just golden and dry to the touch. Allow the cake to stand at room temperature for 15 minutes before gently running a knife around the edge of the tin and removing the ring. Allow the cake to cool and refrigerate for 2 hours before serving. Dust with icing sugar to serve. 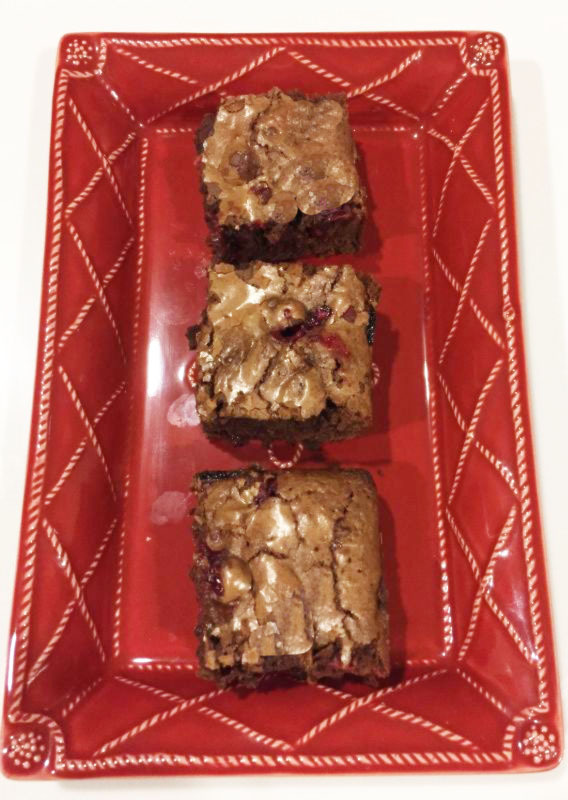 Got some leftover cranberries? Try this whipped porridge. I confess I was surprised I liked this as well as I did. Not that I don't like porridge, I do and even like Cream of Wheat, though I haven't had it since my kids were little. Like my mother, I used to put chocolate chips on the bottom of the bowl so they'd eat every bite. Sometimes, raisins. Which didn't go over nearly as well. I didn't use a whisk in the last step, I used my hand mixer. Adjust the sugar to your taste and serve it with milk...almond milk, coconut milk, whatever. For toppings try berries, toasted coconut flakes ( I was lazy and didn't toast mine, but you should toast yours. ), toasted nuts or bee pollen. I'd rather have it a little warm, but it's not necessary. 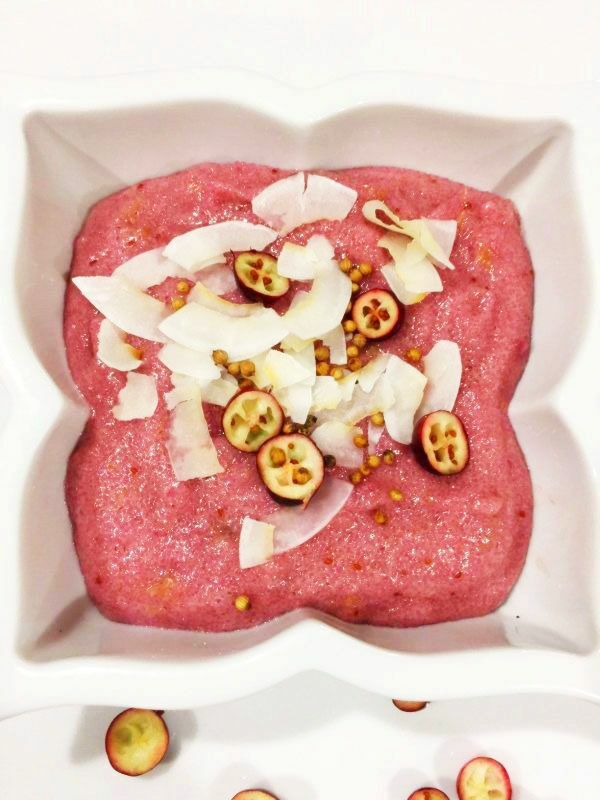 Very unusual, pretty in pink, easy and good for you! In a medium pot, combine the water and cranberries. Bring to a boil, and boil for 10 to 15 minutes. Add the salt and sugar. Gradually whisk in the Cream of Wheat. Depending on what the directions say on the box, let simmer for 5 (I used the 2 1/2 minute type, so did 5 minutes) to 10 minutes stirring constantly. Taste and add more sugar if desired. Remove the pot from the heat and let the porridge cool to room temperature. Serve either at room temperature or cold, with milk and toppings of your choice. Oh my....Thanksgiving is nearly here and Christmas not far behind. Are you ready? I'm not! The flavors and spices of the season always make me happy and they also make me think of gingerbread, which I almost always make at least once each holiday season. Instead, this year I made a cross between a scone and shortbread, but with the flavor of gingerbread. Sort of a holiday, wintery, strawberry (without the berries) shortcake if you like. 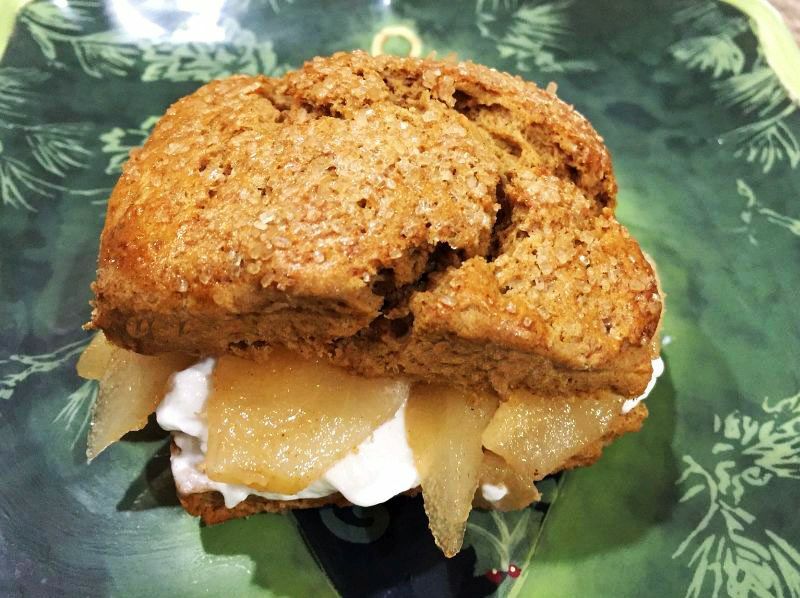 Pears were used in this recipe, but you could use apples or any seasonal fruit you wish. This was a great success and I'll make it again; it's a lovely dessert for the holidays. Bring the water, sugar, lemon juice and vanilla bean to a low simmer. Peel and core the pears. Cut them into 1/4" slices, placing in the poaching liquid as you go. Simmer for about 10 - 15 minutes until tender. Remove from heat and cool completely. Save the poaching syrup. Place the flour, spices, brown sugar, baking powder, baking soda and salt in the bowl of a food processor and process for 10 seconds to blend. Add the cold butter pieces and pulse about 5 times or until the butter is cut into smaller pieces. Combine the buttermilk with the molasses, add and pulse just until the dough starts to hold together in large, thick clumps. The mixture will look a bit like dark lumpy cottage cheese. Pour the dough out onto a lightly floured work surface. Gather the dough and gently pat together into a circle about 7” in diameter and about 1” thick. Cut the dough into 8 equal wedges (or any shape you like) and transfer to the prepared baking sheet, spacing them about 2” apart. Beat the egg with 2 teaspoons of water. Brush the tops only of the shortcakes with the egg wash. Sprinkle generously with turbinado or raw sugar and press it gently to secure. Bake for 14 to 15 minutes, until firm to the touch and golden brown. Transfer to a wire rack. Whip the cream, sugar and vanilla just until very soft peaks form. Don't overbeat. Gently slice the shortcakes in half. Place a dollop of whipped cream on the bottom half and layer some pears. Drizzle with the poaching liquid and top with the other shortcake half. Serve immediately. 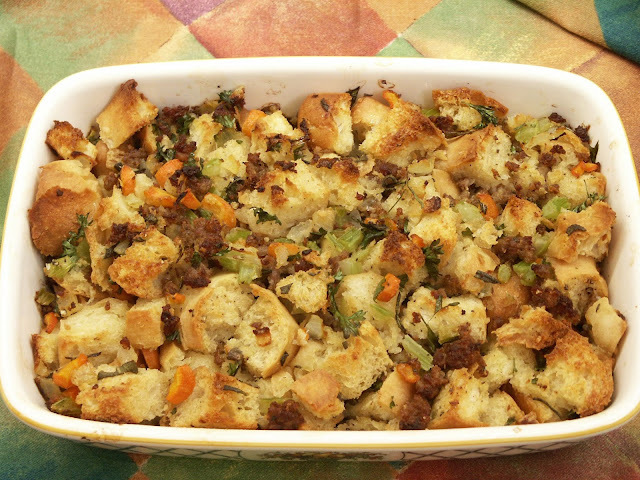 We all have our favorite stuffings for turkey, but it's fun to try out different recipes. My dad never wanted me to vary from my chestnut stuffing, but he's been gone for nearly 15 years, so I have tried some new ones the past few years. I always picture him carving the turkey at the end of the table and saving that slice above the breast near the neck just for me. Crisp skin and stuffing was all it amounted to, but I loved that. 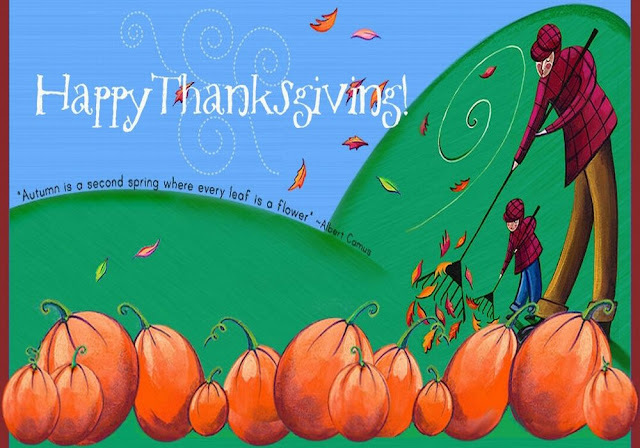 I prefer to stuff my turkeys rather than make the dressing separately, but it's not set in stone. Keller's recipe is made in a casserole and I think you'll love it. Melt 1 tbsp. butter in a 12" skillet over medium-high. Cook sausage, stirring and breaking up meat into medium pieces, until browned, 8–10 minutes. Transfer sausage to a large bowl; set aside. Add remaining butter to skillet; cook carrot, onion, and celery until soft, 5–7 minutes, and transfer to bowl with sausage. Add stock, oil, parsley, rosemary, sage, bread, salt, and pepper to bowl; toss to combine. Spread evenly in a 9" x 13" baking dish. Bake until golden brown and bread is slightly crisp on top, 30–35 minutes. Garnish with more parsley, if you like. I couldn't resist trying these. Any of you who are regulars on Facebook no doubt saw the video; if you haven't, be sure to follow the link under the title as it shows in detail how to make these little cuties. You'll want to take a look at it again to remind yourself how to go about it. I did, anyway. Such a clever idea too. 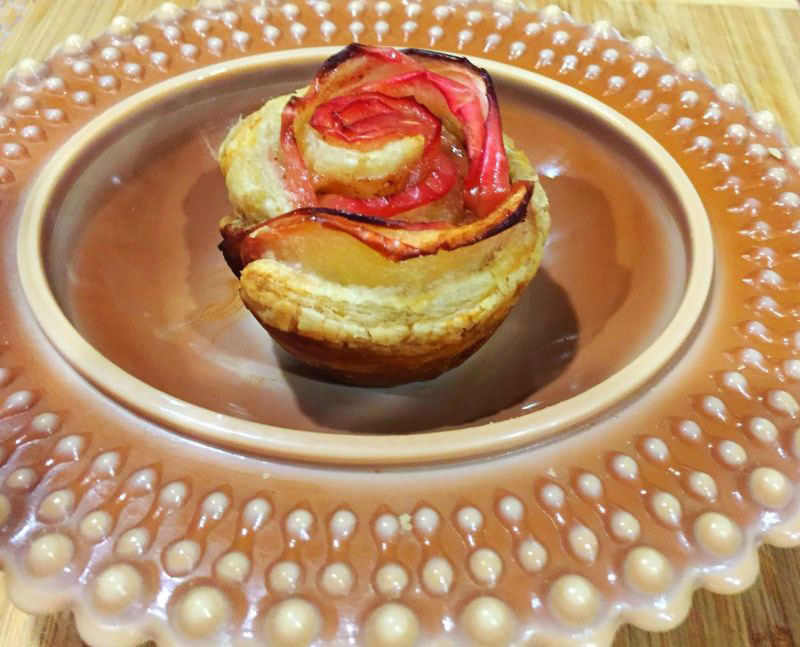 It only makes four rose tarts with one puff pastry sheet, so if you want more, increase the ingredients. It took one apple to make four. Using the cream cheese was an interesting twist too. 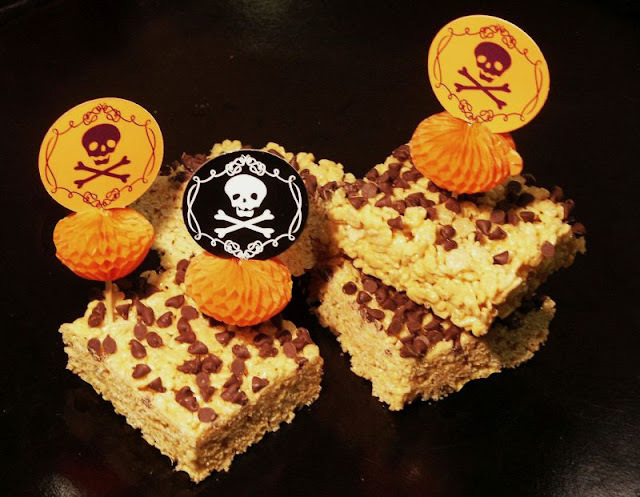 Fun fall food to make, adorable to look at, yummy to eat. Roll out the puff pastry and cut into 4 even strips. Spread cream cheese and sprinkle sugar on the puff pastry strips. 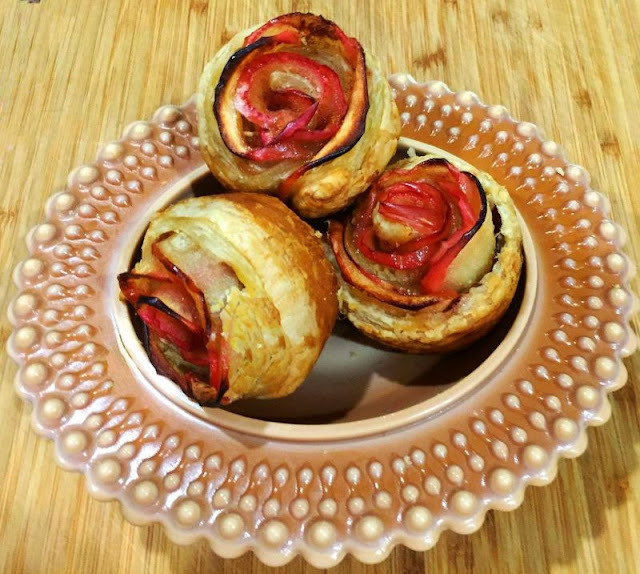 Fold the other half of the pastry over the apples and roll them up. Place in greased muffin tins. You all know I'm not a great chocolate lover, but who could resist these? 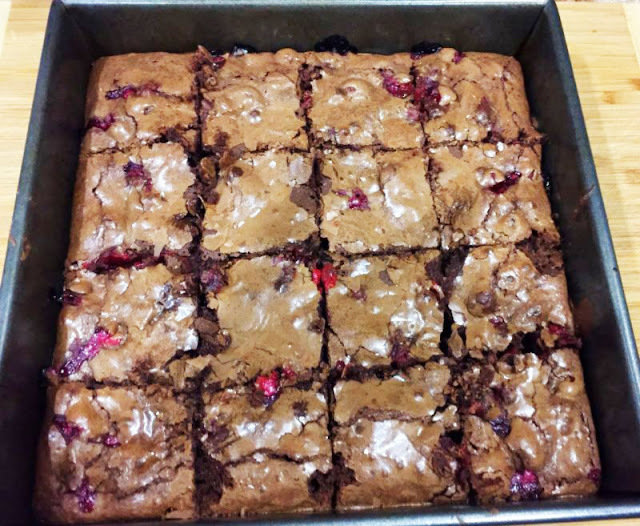 Deep, dark chocolate and chock full of fresh cranberries. 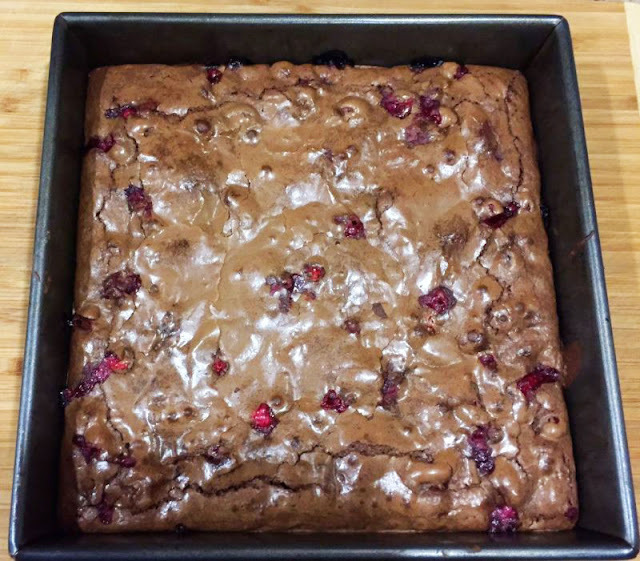 These are fudgy inside, with a crunchy top and when you bite into it, you get a hit of sour from the cranberries. Great foil for this rich brownie and a perfect way to start off my holiday recipes! Heat the oven to 350 F . Line an 8 x 8-inch pan with parchment paper. Break the eggs into a mixing bowl, then whisk in the sugar until frothy. Set aside. Put the butter in a pan and melt over medium heat until it has completely melted. Turn off the heat, add the chocolate, and stir until melted. Whisk the eggs and sugar again until pale and frothy, then whisk in the chocolate mixture until well combined. Sift in the flour and cocoa powder and stir gently with a spatula until there are no white streaks remaining. Add the salt. Fold in the cranberries. Pour the mixture into the prepared pan and level the top. Bake for about 25 minutes, then place on a cooling rack to cool completely. Cut into squares and serve. Line a 8" square baking pan with aluminum foil or parchment paper. Grease the paper with butter. Set aside. Grease a large mixing bowl with butter. Add rice krispies cereal. Set aside. In a medium saucepan, melt butter. Add marshmallows to melted butter and melt, stirring constantly. Remove saucepan from heat. Stir in pumpkin spice. Add marshmallow mixture to rice krispies cereal and stir until well combined. Pour mixture into the prepared pan and press down. Sprinkle top with mini chocolate chips and gently press them down to stick to the bars. Do not spread. Chill bars in your fridge for at least 30 to 40 minutes. Biscuit lovers unite! And you can believe it when the title says "quick". These aren't your perfect round little biscuits....the kind you make for company....no, these are for family and biscuit-lovers. You can throw them together (literally) in 20 minutes and you won't need a bit of butter when they're done, because they bake in a stick of butter! With a casserole or soup and served right out of the oven.....oh my. Honestly, the devil must have made me do it. Melt the butter in glass pan in microwave. Then, mix flour, sugar and baking powder, then add the buttermilk. Pour over the melted butter. 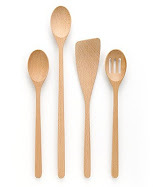 Score with a knife into 9 pieces. Bake for 20 to 25 minutes, rotate once. We make Ina's mustard-topped rack of lamb frequently because it's so simple and I usually have all the ingredients in my pantry. 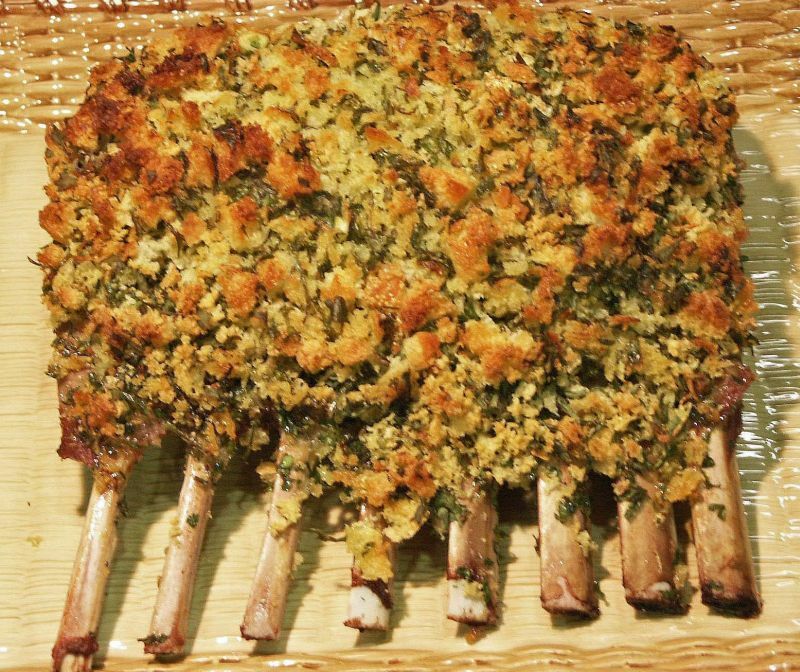 Her lamb persillade is just as good (perhaps better) but does require a trip to the store AND when you cut the rack, most of the delectable crumble tends to fall off. I took this photo before we cut it in pieces. Ina's recipe is, as usual, fabulous. Love the crumbled, crisp, garlicky crumbs on top...I seem to be in a garlic/crumb mood this month.....where they fell off, we just gathered them up after slicing and put them on top of our lamb ribs. If you like your lamb pink, I think you should leave it in the oven just a tad longer than Ina suggests. The center, done exactly according to these directions was rare, which I like, but my daughter doesn't. So I eat the inside ribs and she eats the outside ones. 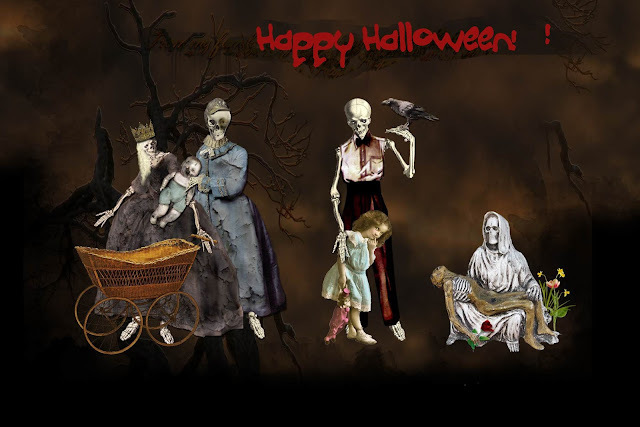 You know, like the old nursery rhyme Jack Sprat and his wife. Place the racks in a roasting pan, fat side up. Rub with olive oil and sprinkle with the salt and pepper. Roast for 10 minutes. Place the parsley and garlic in the bowl of a food processor fitted with the steel blade and process until they're both finely minced. Add the bread crumbs and lemon zest and process for a second until combined. Take the lamb out of the oven and quickly press the parsley mixture on top of the meat. Drizzle with the melted butter and return immediately to the oven and roast for another 15 minutes. Take the lamb out of the oven and cover with aluminum foil. Allow it to rest for 15 minutes, cut in double chops, and serve. Everyone in my family has always loved angel food and chiffon cakes. My aunt used to make a birthday cake on each of our birthdays....always a lemon-flavored angel food cake with 7-minute frosting. 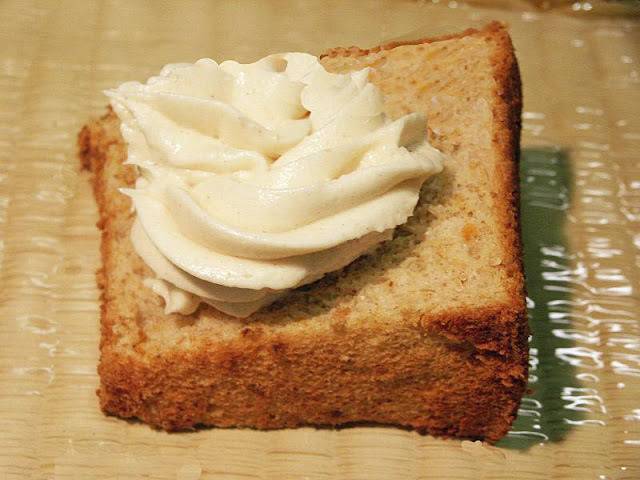 My mother used to make an orange angel food/chiffon cake, the recipe from her friend Alice, with fruit in the whipped frosting...it was divine. I used it often for women's lunches because you could make it way in advance and refrigerate; back in the 60's, you could cheat and buy an orange sponge cake in the A & P. Then they stopped making it and alas, we had to start making it from scratch. 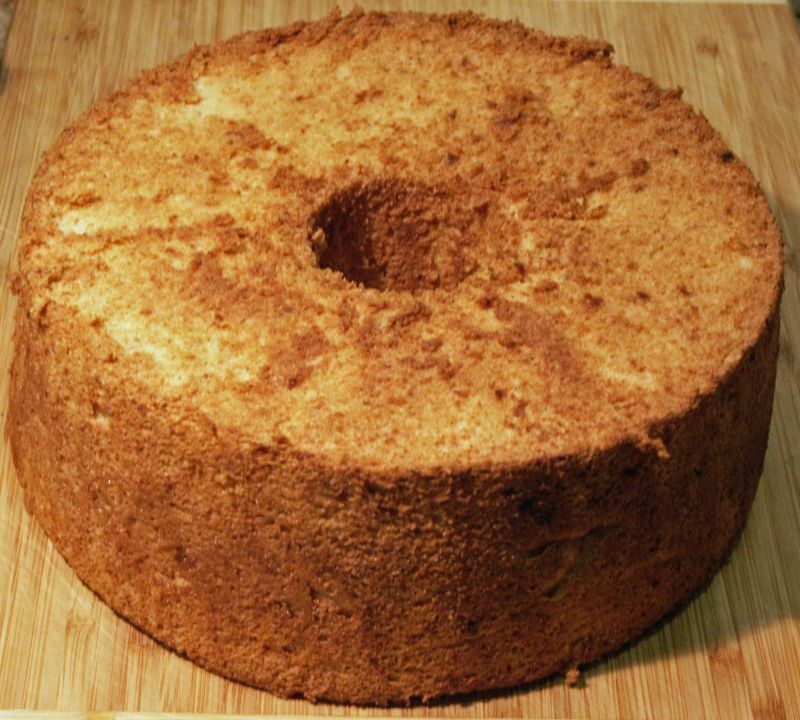 The last family favorite angel food cake recipe I'll share is another idea my mother's best friend Alice (Guess you can tell Alice was inventive in the kitchen!) came up with back in the 40's. I know, everybody makes ice cream cakes now, but back then, it was quite a novelty. And...she used pistachio ice cream, which was a very unusual flavor in those days. Mother copied her idea and would bake an angel food cake, split it in thirds and spread each layer thickly with pistachio ice cream. Then she'd whip some cream, put a teeny dash of green food coloring in and frost the cake. Back in the freezer it went. To this day, when I want an ice cream treat, I buy a small loaf of angel food cake and spread it with pistachio ice cream! Isn't it funny how food combinations you loved as a child stay with you? Like those little pecan tarts from Sanders (anyone remember Sanders? )....I used to sneak them out of the freezer as a child....now I prefer my pecan pie frozen. And stewed prunes with macaroni and cheese. How weird is that? We went home for lunch in the 40's and often Mother made mac and cheese, always serving it with stewed prunes. She loved stewed prunes, made them until her death. This particular angel food cake is pumpkin and as delicious as anything I've had in ages. The frosting is a killer recipe too. The cake is made from scratch (no problem, just be sure you have a tube pan with a removable bottom) and you can frost the entire cake, or just use a dollop of frosting on each slice like I did. Preheat the oven to 325 degrees. You need a tube pan that has a removable bottom. Whisk 3/4 cup of the sugar and the pumpkin pie spice with the cake flour in a medium bowl. Beat the egg whites and the cream of tartar together in a stand mixer for about a minute, until foamy. Increase the speed to medium-high and whip until puffy, about a minute, then add the salt and the remaining sugar a tablespoon at a time. Whip until soft peaks are reached. Remove from the stand mixer and gently whisk in the lemon juice by hand. Sift the flour/sugar mixture over the egg whites 1/4 cup and a time, gently but thoroughly folding in with a silicone spatula after each addition. Now, add the pumpkin puree 1/4 cup at a time, taking great care not to deflate the egg whites as you are folding. Carefully scrape the batter into the tube pan. Tap the bottom of the pan against the counter a few times to settle it. Place in the oven for 50-60 minutes, until golden brown and springy. Remove the cake from the oven and immediately invert. Most tube pans have "feet" or the center portion is taller than the edges allowing the pan to stand off of the counter, but if your pan doesn't, or if your cake rose a lot, invert over a funnel. Cool like this for at least three hours before removing from the pan. This step keeps the cake from deflating as it cools. Run a thin knife around the edge of the pan and around the center tube to loosen the cake. Push the bottom out of the pan. Run a sharp, thin knife under the cake to remove the bottom of the tube pan. You could use a piece of parchment on the bottom before baking, but I find it just as simple to release the cake carefully with a knife. Serve at room temperature. You can serve the cake as is, or frost with the following recipe. I just sliced and used a dollop of the frosting on each piece. Cream together the butter and cream cheese until well combined and fluffy. Add in the vanilla. Slowly beat in the powdered sugared and then the cinnamon. Continue to beat until everything is well incorporated and the frosting is fluffy. When I first saw this idea on Pinterest, I thought how much fun it would be to try. 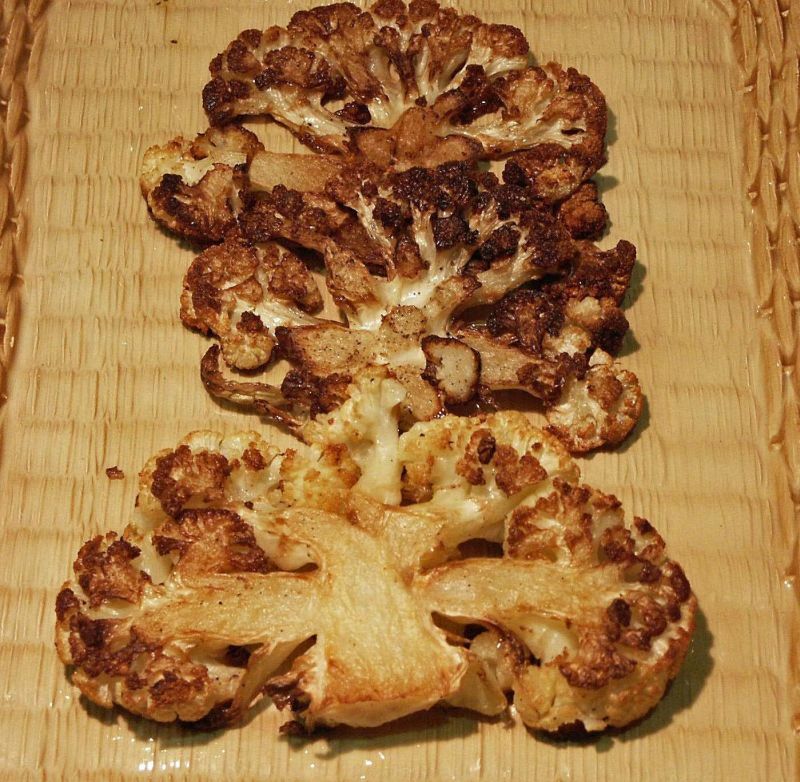 Of course, we've always loved roasted vegetables anyway...so much more flavor....so I knew it would be delicious, although do try to get a very large head of cauliflower as we only got three decent steaks out of ours. Not that we didn't use it all, we did. Just add the extra florets to the pan and oven and they'll be every bit as delicious as the steaks. Slice the cauliflower through the center, keeping as much intact as possible. Season the “steaks” with salt and freshly ground pepper. Heat a cast-iron skillet over medium-high heat. Add olive oil and place cauliflower carefully in the pan. Sear the cauliflower for 3 to 4 minutes per side, until deeply golden. Remove from skillet and place on a parchment-lined cookie sheet. Place in the oven for 15 minutes or until nicely caramelized. Serve immediately. 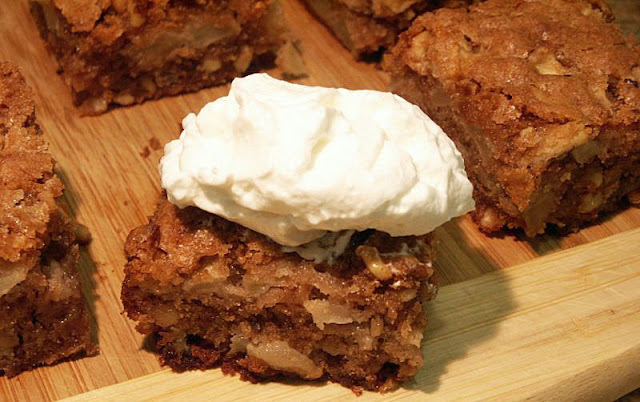 I've made a lot of apple cakes over the years, but this one is quite unlike any I've ever baked. Cathy says her Mom got the recipe from a woman she used to work with in downtown Los Angeles over fifty years ago . Nobody seems to know any more history about it than that. Oh, and that it was her dad's favorite, now hers. You mix it all by hand....the batter is quite thick, so it takes some muscle. I didn't change much, but made it in a slightly smaller pan (Looked everywhere for my 9 by 13 but since I moved, I've stuck it someplace and now can't find it; I used an 8 by 11), so my slices are a bit higher than Cathy's, which means I also had to bake mine about 10 minutes longer. I also used the Maida Heatter method of greasing the pan....butter, then sprinkled with dry bread crumbs. Also, I think there is too much salt, so cut back on that a bit if you want. 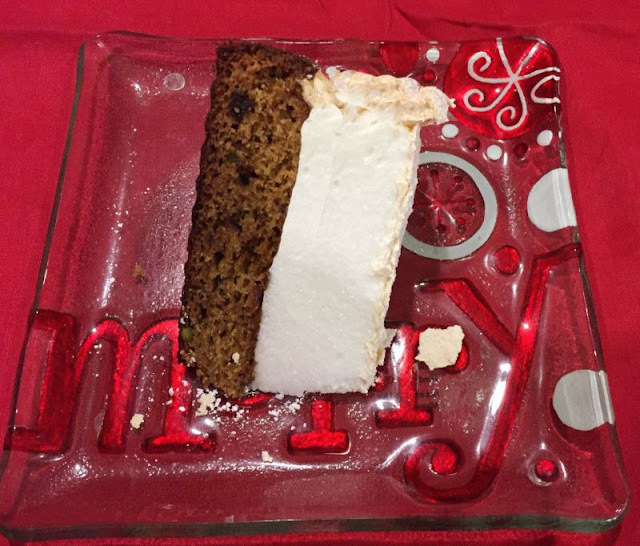 It has a lovely crunchy top and I found this to be quite a sweet cake, so no frosting needed, but it definitely needs a dollop of whipped cream on top. 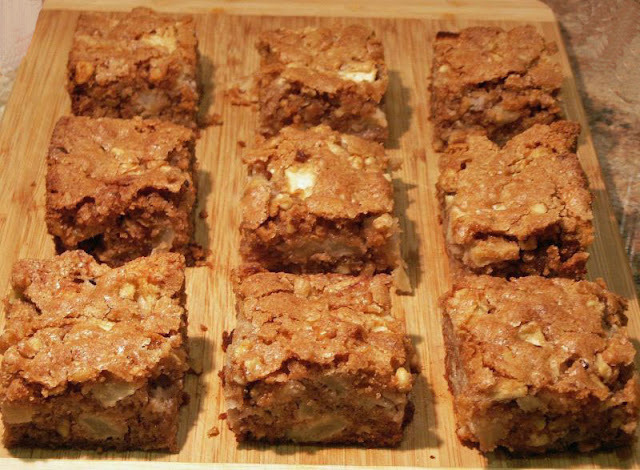 When you bite into it, you get a mouthful of chunky apples, crunchy walnuts and a lovely hit of cinnamon. Yum! Note: Leave the apples chunky; it you slice too thin, the cake will be wet. I think Cathy has a photo of the size the apples should be cut on her blog. I peeled, cut in quarters, seeded and then sliced into chunks. Also, my Granny Smith apples were quite big so I only needed 5 to get 4 cups. Another nice thing about this cake: you can cut the recipe and make it in any size pan you like. 9 by 13 makes a lot of cake. In a large bowl combine sugar, flour, cinnamon, salt and baking soda. In a small bowl combine eggs, oil and vanilla; add this to the sugar-flour mixture in the large bowl. Mix thoroughly. Batter will be stiff (do not use mixer). Add the apples and walnuts. Pour into baking pan and cook for 50-60 minutes or until the middle springs back when touched. Serve with whipped cream. Even better the next day! It's time for a pumpkin recipe, don't you agree? Fall's not officially here yet, but it's never too soon for pumpkin fever! I made these last year so you can save this one for Thanksgiving...but be warned...make plenty because I ate three of them before I realized what I was doing! 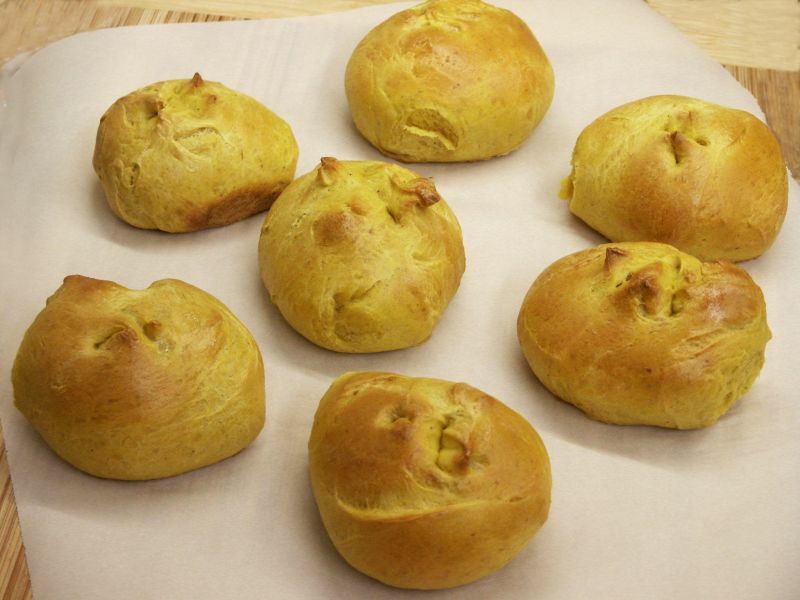 So tender (I adore brioche of any kind) and these gems turned out so well, so easy, you really must try them for the holidays. This makes a dozen rolls. In a large bowl or bowl of a stand mixer, combine 1¾ cups flour, sugar, salt, cinnamon, ginger, cloves, nutmeg and yeast. Add pumpkin, warm water, butter and eggs. Stir, adding just enough of remaining 1½ cups flour until a dough forms that pulls away from sides of bowl. Knead dough with dough hook attachment in stand mixer on medium speed 5 minutes until smooth, soft, elastic and only slightly sticky. (or you can knead by hand) Shape dough into a ball, then place in a large lightly greased bowl; turn to coat. Cover bowl with plastic wrap and let proof in a warm place 1 hour until doubled. Preheat oven to 375 degrees. Line a baking sheet with parchment paper. Punch down risen dough, then divide into 12 equal pieces. Roll each piece into a ball, then place on prepared baking sheet spaced at least 2 inches apart. Cover with a tea towel or lightly greased plastic wrap and let rise 30 minutes until doubled. Just before baking, use scissors to snip tops of rolls about ¼-inch deep. Brush tops and sides of rolls with egg wash. Bake 20 to 25 minutes until golden brown.